To borrow from an insightful blog Obama is representative of the Black american we seldom see in publishing. Meaning, he is not a whore-monger, drug-dealer, drug user or absent baby-daddy. He is not a slave to designer labels and he does not wear bling. We have not seen him ducking into a bodega to buy a forty, he does not congregate on street corners, and no source has come forward to reveal that he smoked a blunt before his debates with John McCain. If he wears a "wife-beater" it's hidden beneath his shirt, exactly where it's supposed to be. He does not wear his pants down around his knees, nor does he throw up gang signs at the end of his wildly televised speeches.OK so after nearly a decade of the market being deluged with books focusing on the aforementioned stereotypes what happens now?Will publishers change gears and begin publishing works written by African American that speak to a multitude of people? Or will they remain stagnet and committed to a shattered belief system? Q. Where did you find the original impulse to write The Seer? Ta'Shia. 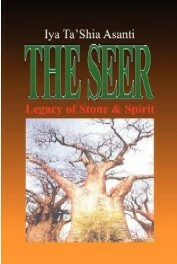 The Seer is based in theory on my own life experiences as a seer and medium, as well as my journey is exploring African history pre-slavery and becoming a Yoruba priestess. Q. Who inspired the characters of your novel Ta'Shia. The characters in my book were inspired by the Orisa, dieties of the West African spiritual tradition, Ifa, as well as the ancesters who came to visit me in my dreams for nearly 20 years. Q. Looking at the book now, what surprises you? Ta'Shia I thought mainstream America would really have a problem with this book but so far, it has touched all who've read it. Q. Many writers describe themselves as "character" or "plot" writers.Ta'Shia. Which are you? What do you find to be the hardest part of writing? I would classify myself as a Character writer though I love a strong and moving plot. Q. Who has influenced you in your writing? Ta'Shia. Eric Jerome Dickey, Octavia Butler are two of my greatest influences though I'm a fan of Robin Cook and a huge lover of all things Sidney Sheldon. Q. What was the book that most influenced your life and why? Ta'Shia. One of the books that really moved me was Robin Cook's Outbreak as well as Sydney Sheldon's If Tomorrow Comes. Q. What are your 2 favorite books and why? Ta'Shia. Two of my favorite books are The Other Woman by Eric Jerome Dickey and The Interruption of Everything by Terri McMillan. I also love EJD's newest hitman series, Sleeping With Strangers etc. Ta'Shia. I am currently working on the sequel to The Seer. It’s called, The Bones Do Talk.